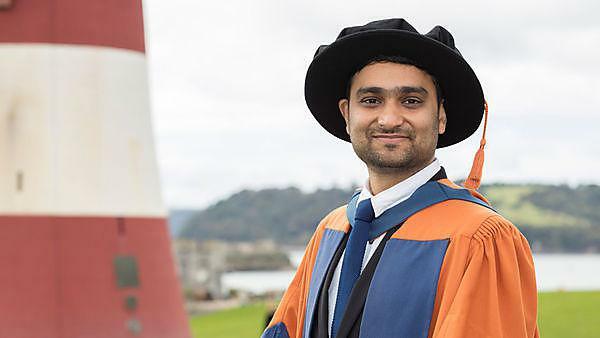 Vaibhav now works as a Postdoctoral Research Fellow at Queen Margaret University, Edinburgh. “Risk taking is often associated with creativity, yet little evidence exists to support this association. The title of my PhD project was ‘The Risky Side of Creativity: An investigation of the role of domain specific risk taking in creative individuals’. “We take risks pertaining to various domains every day; social risks, in particular allow us to experience the world with an open mind and were found in my research to be associated with being creative. "It is quite exciting to see this research resonate with so many people who have since shared their personal stories with me both privately and publicly. “My research was featured in the Guardian and received significant attention from the scientific community. "I had an opportunity to spend a few weeks during my secondment with Professor Mark Runco, a leading creativity researcher at the University of Georgia, Athens, GA, United States of America. "Experiencing cutting-edge behavioural research in the USA was one of the most exciting elements of my PhD project. “Since completing my project, I have been working on publishing the second half of the research from my thesis as an scientific journal article. I have also moved to Edinburgh to take up a postdoctoral job at the Queen Margaret University. "I am working on a project investigating school participation in children and the factors that reduce school participation in children with health related additional specific needs." “I would advise aspirants to choose a topic of research that resonates with their personal and professional interests, and an institution that can provide facilities to carry out that research. I would also advise them to reach out to the international community of researchers in order to extend their collaborative network. “The field of research is a challenging and demanding endeavour. But always remember, hard work and focus always lead to success, no matter how hard the path is. Oh, and don’t forget to have fun! “My PhD supervisor, Professor Sue Denham and my internal collaborator, Professor Yaniv Hanoch guided me through all the ups and downs during my PhD journey, while my colleagues from the CogNovo program encouraged me to keep going. I found support and motivation at the University, which greatly enhanced the number of opportunities I had to excel in my research field. “Plymouth provides state-of-the-art research equipment and spaces for conducting research in neuroscience, psychology and many other research fields. In addition to these research facilities, the University also provided me an opportunity to be a part of an international, multidisciplinary team of PhD students, called CogNovo. This EU Marie Curie funded PhD program allowed me to work closely with researchers from a spectrum of fields such as robotics, computational neuroscience, psychology, film restoration, arts and humanities which was complemented by my own research in the field of cognitive neuroscience." Plymouth's Cognition Institute is an innovative interdisciplinary research environment which brings together researchers working on the understanding of human cognition, together with the application of findings to the development of innovations which improve people's lives, interactions with one another, and with the world. CogNovo is an Innovative Doctoral Programme, funded by the EU Marie Curie initiative and the Cognition Institute, to foster research training in the emerging field of cognitive innovation. The Guardian converted Vaibhav's scientific paper into a quiz. Why not have a go yourself and see if you can see a link between creativity and risk taking in your own behaviour?